Next month, two seminal image-sharing communities, FFFFOUND! and MLKSHK, will close their doors within a week of each other. Launched in June 2007 as a side-project by a Japanese design agency, FFFFOUND borrowed the visual bookmarklets of Wists, a social shopping service launched a year earlier, to rapidly form a community around the curation of art and other imagery. Invite-only for its entire ten-year run, each user only received a single invite, forming a small but dedicated community. Despite the constrained user base, FFFFOUND users added over 500,000 images by the end of its second year. Though the site’s features or design barely changed after 2008, it inspired dozens of similar services, including Pinterest, which launched in 2009. 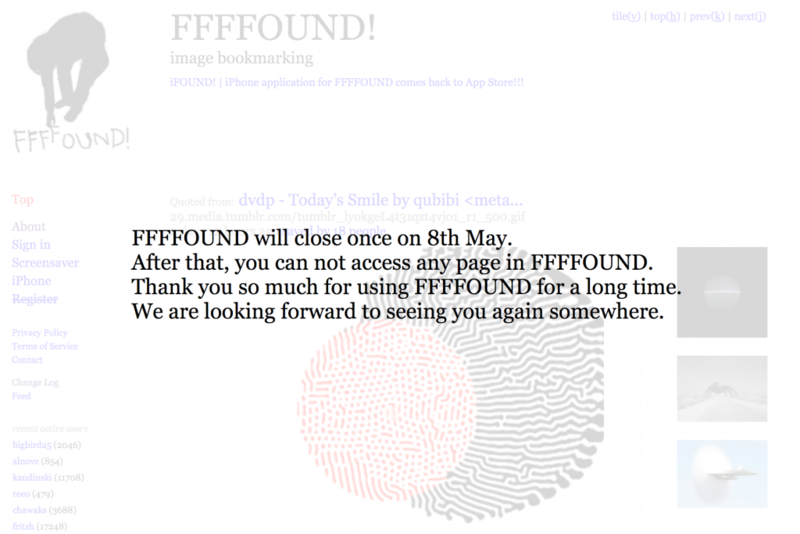 Yesterday, Tha founder Yugo Nakamura announced FFFFOUND would close on May 8. Husband and wife team Amber Costley and Andre Torrez launched MLKSHK (pronounced “milkshake”) in 2011, a community for sharing images and videos, inspired by the secretive private file-sharing community that Andre started in 2001. MLKSHK nearly closed in September 2014, a result of rising bandwidth and maintenance costs, but a combination of paid subscriptions, volunteer effort, and outside funding (i.e. Andre got a job at Slack) kept it around for three more years. In February, Amber and Andre announced that MLKSHK would finally shutter, switching to read-only mode in April and closing entirely on May 1. 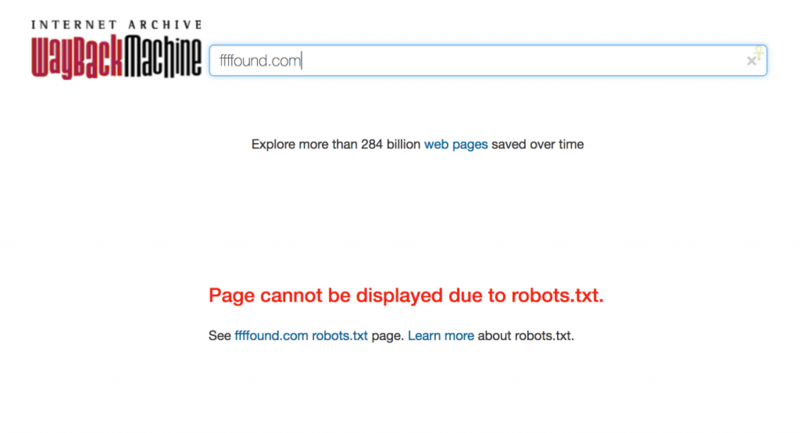 More upsetting is the fact that FFFFOUND only allows Google, Bing, and Yahoo to crawl their archives in their robots.txt file, which outlines which crawlers can access their site and how frequently. As a result, the Internet Archive is forbidden from archiving FFFFOUND. It seems likely that, barring a large-scale preservation effort, this will be all that’s left of FFFFOUND after May 8. That’s a common end to online communities: we’re shutting down next month, your work will be deleted, thanks for participating. MLKSHK took a different path. MLKSHK’s permissive robots.txt allowed all crawlers, which in turn led to comprehensive historical snapshots, almost daily, in the Internet Archive’s Wayback Machine from launch until today. The MLKSHK creators also reached out to Archive Team, the group of volunteer archivists who preserve sites like Geocities, and asked them to archive the site. Collectively, they grabbed nearly 2TB of images and other assets, which will eventually make its way into the Internet Archive’s collections. Preservation is important, but Andre and Amber went much further: they donated it to the community that helped make it great. MLTSHP (pronounced “malt shop”) is a volunteer-run effort to transition the community to a new home under a new name. Amber and Andre gave the code, assets, and anonymized database to a small workgroup of volunteers, who open-sourced the code with permission and raised over $3,000 in a fund drive to cover startup costs to get it off the ground. Once launched, MLTSHP will allow former MLKSHK users to opt-in to transitioning their account. Everyone else’s accounts will stay hidden from public view. They’re moving quickly with a functional private beta already running, and it seems likely that MLTSHP will relaunch soon, keeping the spirit of the community alive. Want to help? You can learn more on their Github project. Online communities close all the time, and for all kinds of reasons — usually a lack of time, funding, or interest. But how they decide to dissolve the collective contributions of a community impacts how they’ll be remembered. To be clear, a transition effort like MLKSHK’s isn’t free. Especially for bandwidth-heavy communities, the costs of preservation can be significant, and handing off code, assets, and data responsibly takes effort. Not everyone can pull it off, but it’s an act that should be commended. As a community founder, closing a community with care honors all the people who made it meaningful.